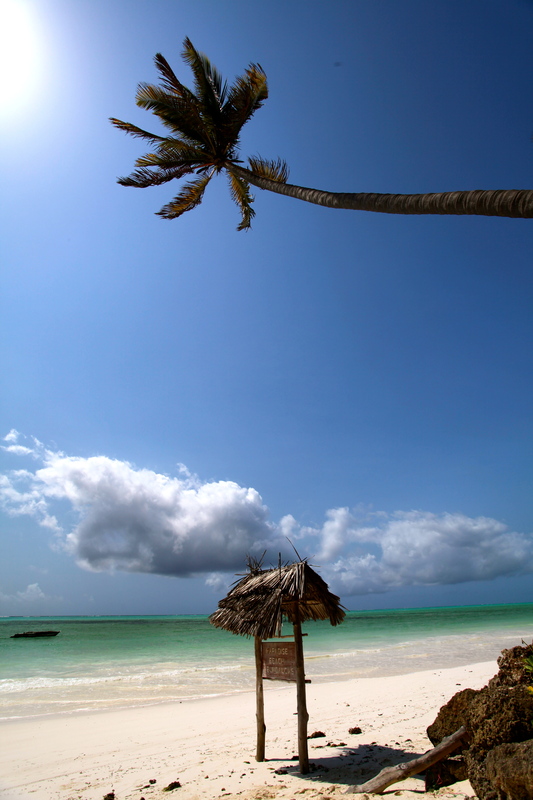 Mambo Jambo from the spice islands, the Indian Ocean, the land where palm trees sway, where dhows glide blissfully across the horizon, where the sun sets spectacularly and the call to prayer is frequent – Zanzibar! It is difficult to believe how quickly you can go from village to genocide memorial to big city to safari to paradise islands… Well, when I say quickly, there were some of the most epic bus trips of my life along the way… We left Kigali on what was meant to be a 12 hour bus trip across the border into Tanzania. If only life here was so simple. We ended up dumped in some end-of-the-earth taxi park in a town called Nzega, told the bus was coming ‘soon’. How soon? Three minutes. Great. Two hours later, still no sign of any kind of bus (although one did come into the taxi park called the “Virgin Express” – it wasn’t going our way though…). Finally, after dark, the bus arrived, packed with people and no spare seats. It was only a four hour trip so we said we’d stand. We were desperate. At one point I was sitting on the knee of some boy wearing a t-shirt that said WEAR CONDOMS! (he worked for an AIDS awareness organisation), Cherie was being burnt from sitting on the engine and when Kirsty tried to close her eyes to sleep the guy I was sitting on told her to keep her eyes open because if we stopped suddenly she’d be thrown through the windscreen and would need to be looking out to brace herself. Life was good. We finally made it to Mwanza, a Tanzanian town on the southern shores of Lake Victoria, long after dark and were guided by a friendly local guy to a place to stay. 18 hours of chaotic African travel – we slept well that night! In Mwanza we decided that given everyone but us comes to Africa to see the animals, we should splash out and do the same – safari! We spent three incredible days travelling through the Serengeti National Park and Ngorongoro Crater where zebras, giraffes, elephants, gazelle, baboons, buffalos and lions roam… It was truly spectacular. The Serengeti is what you dream about when you think of Africa – dry plains stretch forever with acacia trees punctuating the landscape and wild animals wander. I think I took more photos of trees than animals but to be standing with your head out the roof of a 4WD in the middle of Africa watching giraffes and elephants roam takes your breath away. The next day we drove to Ngorongoro Crater – one of the ‘eighth wonders of the world’. It was spectacular, albeit freezing! We ended up wearing all the clothes we had brought with us as we drove down into the crater (but even wearing four t-shirts does not make you warm I learned). It was like being on the moon – except that there were lakes, elephants, zebras and lions… It was an incredible experience, one that will be forever imprinted on my mind. Yesterday we caught the ferry over to Zanzibar which was an experience in itself. The ferry was divided into different classes – with a compulsory VIP class for foreigners. I was not happy being in our segregated section (which despite being ‘VIP’ had fleas!) so went off wandering to the top deck where the views of the Indian Ocean were spectacular. We stood out like sore thumbs amongst the local Muslim population who are all covered head-to-toe but I was too excited at being covered in salty spray to mind the stares. We pulled into the quay and stumbled off the ferry, laden with everything plus the kitchen sink. On our volunteer budget we’d decided to splash out and buy casks of wine for our island indulgence and as we trudged up the gangplank I attempted to carry mine on my head. God knows how they do it here – I had a headache within minutes. And it was simply too dangerous to risk losing 5 litres of South Africa’s finest wine over the railing. It was a short-lived stint. The winding streets and alleyways of Stone Town where we currently are feel more like Western Europe than Africa but the women covered up in their full-length burkas remind me more of Turkey. There are the most incredible food markets on the waterfront where we ate fresh fish kebabs last night and watched the sun set with glasses of wine and it was bliss. Tomorrow we’re off on a snorkelling adventure at some secluded beach and then we will spend a few days on the east coast of the island. On Sunday we lose Kirsty who is flying back to the UK for the next chapter of her life. I am so sad to be losing her and it’s not going to be the same without her but the time we’ve shared will be with us forever – and she’s promised to meet me at Gatwick airport in November with a latte!! It’s pretty amazing to have come to Africa with someone you didn’t know and to leave with a new best friend. As Kirsty says, our three month blind date has been a roaring success! Cherie and I will continue our travels until school goes back in early September. At this stage, it’s looking like an extended stay on Zanzibar is on the cards… Palm trees, white sand beaches, endless heat, turquoise water – we must make the most of it before our return to village life!